Every stranger is just a friend they haven't met yet. You want me to watch for what? 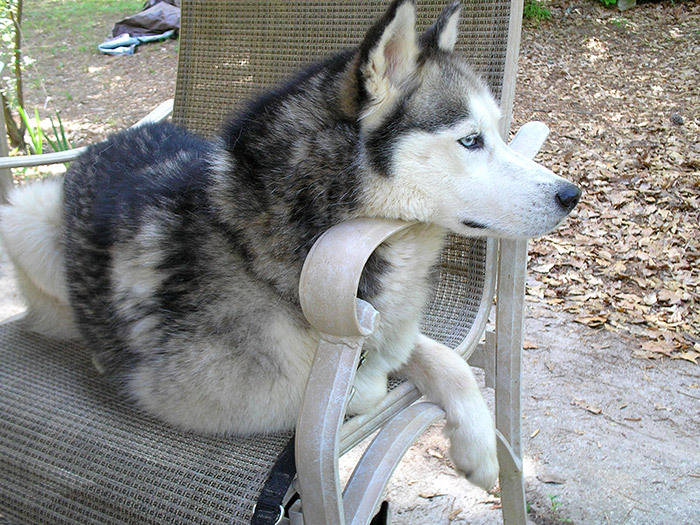 Siberian Huskies have an extremely sociable nature that makes them useless as watch dogs. In fact, if a burglar broke into your home, your Sibe would likely show him where the money is and then invite him to play. A Siberian might do harm in kissing a burglar to death, but that can take some time. On the bright side, Siberian Huskies are very pack oriented. This means that while they would be happy to make friends with the burglar, they will also happily be friends with everyone they meet. There are exceptions to the rule, of course, which is why it is always important for any dog to become well socialized with a multitude of different people and dogs in various settings. What does socialize mean, exactly? It means that a dog should have "happy" encounters with lots of kids, other dogs, and people. Dogs don't necessarily generalize well. For example, a dog could live very happily in a home with another dog. This dog never leaves the house to meet other dogs, and so they never get to learn more than how to react within the setting they are accustomed to. When that dog goes out on the town one day and is insecure the first time he meets a different dog in this new setting, who's to blame? This is why it is so important for a husky (or any dog) owner to socialize their pet beyond their "known" pack. Within the Siberian Husky personae, it is typical for a husky to bond with their pack whether it is other dogs, humans, or both. Being pack oriented, they can sometimes be wary at first of creatures outside their pack. A plumber can come into your home to do his work and a husky might stand himself between your daughter or son and give that evil eye as if to say, don't touch my sibling. However, keep in mind that if you are looking for a reliable protector don't count on the husky to do the job. You want me to guard? Nah, I'll just observe from here.